Does it hump legs and pee on lamp posts though? I think that's an optional add on. As is mauling the children of the owner and leaving sloppy 'deposits' in it's wake. All available for a small extra charge. I would go for the top mounted computer aimed cannon option myself. ...and to commit suicide, it lays down in front of a hot fire.. I wonder if they're doing a 6 leg version! This is actually quite amazing. The technolgy will eventually end up in consumer products, as most military inventions do. That is amazingly close to animal capabilities. Astonishing to watch. It is. Watching that video I guess the thing holding robotics back now is the power source / battery tech. Just to say one thought I've had about the military and robots. It might allow them to be more humane. Soldiers use lethal force because their lives are at risk. But when it is a robot, it can afford to be shot at and damaged as it say marches towards some member of the taliban and injects them with anaesthetic, or grabs them and disarms them and handcuffs them. 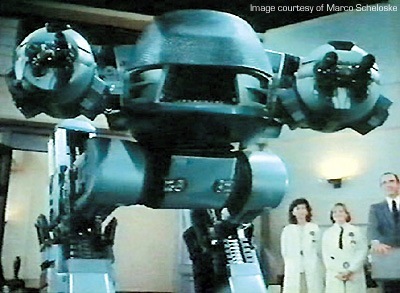 there would be no need for electrodes on gonads in abu graib then.....the sheer terror of watching a prisoner being "cocooned" by a giant robotic spider prior to interrogation would scare the mahdi army shitless! well they send us vids of their captives proir to beheading them, we'll just send a few back of their combattants undergoing a restraining procedure. phase 2 of the process is where the giant robotic spider injects the poor victim with fangs filled with LSD. ....that would be a seriously bad trip. I saw a lecture a couple of years ago from the prof behind these robots. They spent ages videoing and computer modelling different animals to figure out how they could stand up and eventually figured out that it's not the brain responsible for a lot of it but a very clever skeleto-muscular system of tension. They simplified the scheme and made plastic tensioners for the legs and viola! No gyroscopes, 3d cameras and massive computing requirements. Impressive leap forward for robotics. I think I read some bizarre thing saying the best power source idea at the moment was food - just like people. What was that really loud buzzing noise in the earlier part of the second video? If it was the motor, it's not exactly going to be able to sneak up on its prey!